Refugees are too often viewed within Europe only as a burden. The Refugees on Rails team wants to prove that our new neighbors offer an opportunity for Europe to enrich its culture and empower its economy. They believe that all human beings have the right to live up to their potential and to improve themselves. 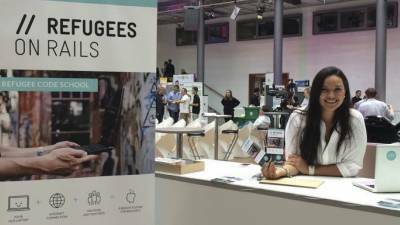 The aim is to help refugees build and expand their qualifications as software developers and give them the chance to work with start-ups and tech companies. They are doing this by creating a coding school. The vision is an intensive one-year program that is supported by start-up mentors and taught by volunteer developers. The school will be set up within a refugee home with 20 desktops for teaching. Most of the content and curriculum will be online. The participants will work on real projects for refugee programs, open source applications and problems at partner companies. The first part of the program will teach skills. The second part will generate real output. Participants who complete the first part will receive a donated laptop on loan for a year. Participants who complete the second part will receive an internship offer at a partner company.